Eleven years ago Tim Berners-Lee said that the next logical step for the World Wide Web was semantic. The idea was that one day machines could read and understand Web pages. Content would be tagged in a meaningful way: a date would be tagged as a date and an address as an address. Relevance would replace ambiguity. Finding, sharing and combining information would become easier. 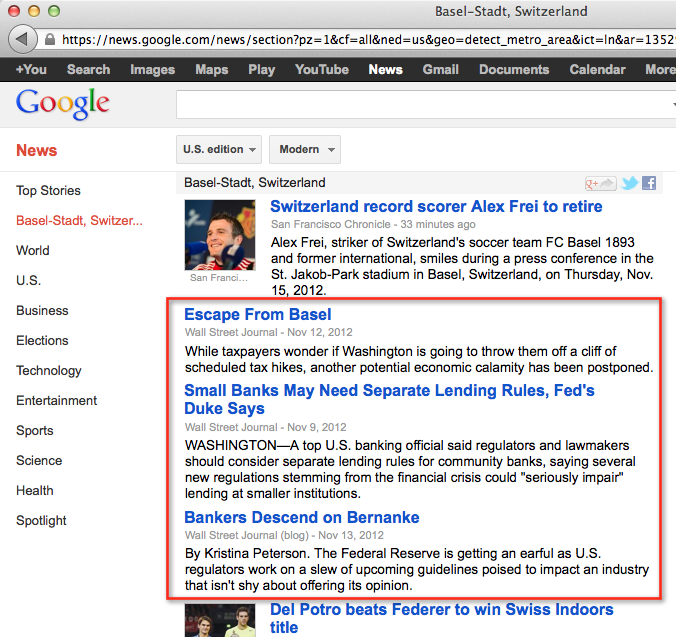 When in Basel, Switzerland, go to Google News. Look at the top stories. See a bunch of stories about bank liquidity requirements? Minimum capital levels for financial institutions? How are these stories relevant to you being in Basel? They are not. Google is doing simple string matching. It detects your geographical location to Basel. It then finds news stories that say "Basel". It doesn't know that the Basel III agreement that regulates bank capital adequacy just happens to be named after the city where it was written. If Google looked at the dateline of the news item it could see that the story was not written in Basel. It could see that the story is not relevant to you. If all stories had datelines Google might have a chance to do so. It's a mess. The technology for semantic Web exists. Tagging content is a no-brainer. But we humans are not very good at applying it. We are messy and illogical in our ways. I suppose it is appropriate that we suffer from irrelevant content as a result.